Site: 95" diameter topographic base finished with roads, walks, water features, landscaping, cars and people. Building: Detailed laser cut buildings with full color and materials represented. Windows, mullions, doors, facade fenestration, balconies, trim and roof will be delineated. Smaller outbuildings and cabanas will be included. Orchid Bay is 20 stories of distinctive Florida condo residences. With spacious floor plans that range from 2,263 to 4,371 square feet of living space to choose from, one is sure to meet your requirements. What is more, the most desirable resort-style amenities are right on the property. The additional attractions and tranquil beauty of West Bay Club are a pleasant stroll away. Your days will be touched with the pleasures of living at Orchid Bay resort. Easy access to the Southwest Florida International Airport (RSW), Naples, Bonita Springs, Fort Myers, Cape Coral, Sanibel Island, and the many area Golf Courses and shopping centers. Families can enjoy the beach while you relax on the golf course. 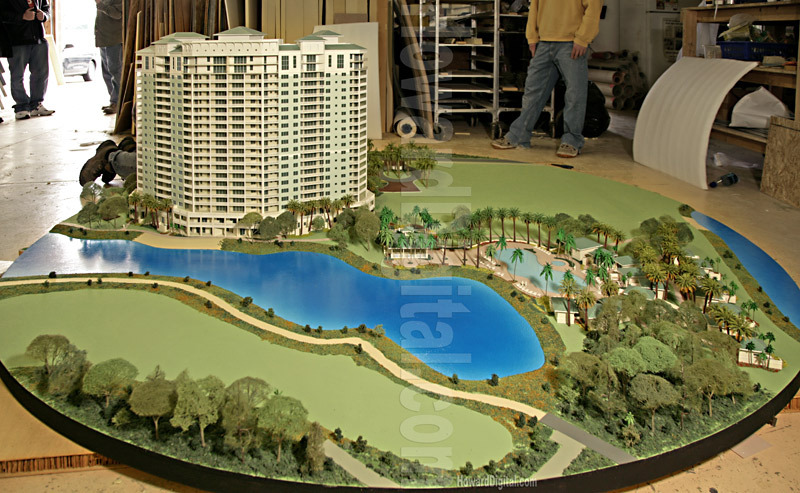 See our Orchid Bay Architectural Rendering also!